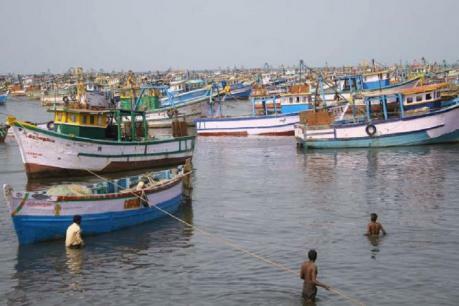 The Sri Lankan Navy has fished the fishermen with giant patrol vessels on Indian border. The Rameshwaram fishing harbor was deserted. Continuous diesel price hikes and fears of the Sri Lankan government's new fishing ban law threatened. Fisheries workers went fishing for more than 50 fishing boats in the morning and took more than 500 fishing. They were fishing in between Dhanushkodi and Sri Lanka.